Christopher Morahan’s Stevie that opens this year’s season at Chichester, is a masterclass in modern drama. From the life and work of 20th century English poet Stevie Smith Hugh Whitemore’s carefully crafted text, weaves extracts of Smith’s verse into a narrative tell of poetry allowing her to escape a dull middle-class suburban world. Spanning decades, the play takes place entirely in Smith’s sitting room in Palmers Green. It’s a compact work. Chris Larkin takes on the role of various male friends of the poet (including a post-war chap who bears a striking vocal similarity to Maggie Smith) whilst Lynda Baron plays the Aunt who tended to Stevie since childhood and who in turn was cared for by Smith as she became old and infirm. Baron (aided by excellent wig work from Campbell Young) convinces as the wise and humdrum relative, more moved by letters from the Inland Revenue than her niece’s writing, yet all the while still showing her charge love and care. It’s a performance of subtle charm and Baron is marvellous. 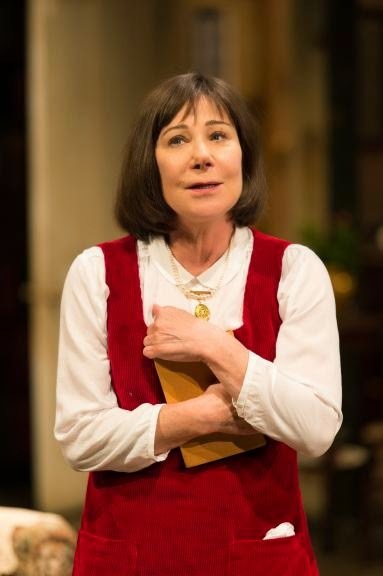 Driving the work however is Zoe Wanamaker’s astonishing Stevie. On stage almost throughout, the role is massive both in terms of her character’s emotional complexities (Smith suffered from depression) as well as the sheer volume of text. Wanamaker is sublime, capturing the fragility of Smith’s youth, blighted by TB and from there charts her life with perception. Smith displayed a sanguine self-deprecation, referring to her parents unhappiness she describes herself as the “product of an unsuitable marriage”. Chain smoking and mainly plainly dressed, Wanamaker bestows on Stevie the gimlet eye that gave her poems such clarity of vision. Later in her career, she observes to a friend that “one doesn’t want happiness in a poem, it spoils the fun”, yet when she reflects upon her Aunt, now passed away, Wanamaker comments that on having lived with an old lady from an early age, one “never ceases to be a child”. That she can breathe sensitive and empathetic life into these two sentences, each at opposite ends of an emotional spectrum, is a mark of Wanamaker's understated excellence. Her Smith is at all times a down to earth north London suburbanite, feted for her talents for sure, yet in Wanamaker’s performance, remaining aloof from the Bohemian pretensions that one might perhaps associate with the Hampstead or Bloomsbury sets. Morahan is masterful in his direction. Finely crafted movement work conveys time and age and adds to the excellence of the production, whilst Jason Carr's music adds a fine accompaniment. There are few finer performances to be found than Wanamaker’s Stevie and this unmissable performance demands a London transfer.